As the Country Music Capital of the World, Nashville is a popular year-round vacation destination. Even though Music City is best known for its honky-tonks and other adult-themed distractions, it also offers a wide range of activities that children will love. Nashville is filled with museum exhibitions and playgrounds as well as shops and restaurants that were created with children in mind. When planning a trip to Nashville, consider the following list of kid-friendly activities and annual events that will educate and entertain your little ones. 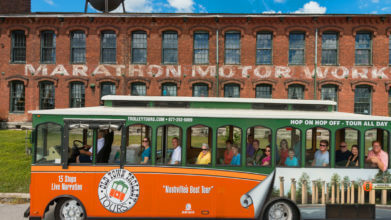 To see the best of Nashville in a fun and safe environment, hop aboard the Old Town Trolley. Children will enjoy riding the trolley as it makes its circuit around Music City. They will hear an entertaining and educational narrative while traveling past many of Nashville’s most popular and well-known landmarks. The Old Town Trolley is also a great way to reach many of these attractions. This convenient form of transportation saves time by eliminating the need to navigate city traffic and find a place to park. The hop-on and hop-off privileges will help you create a personalized itinerary that allows your children to explore the places that interest them the most at their own pace. And for the adults, all you have to do is sit back and relax while you create lasting memories with your family. Also, kids under the age of 4 ride totally free! It might as well be a proven fact that children love running around outside. Several of Nashville’s most visited attractions combine excitement, education and outdoor fun in one location. Opening in 1990, the 200-acre Nashville Zoo at Grassmere is home to more than 360 species that come from many different parts of the world. Residents include giraffes, kangaroos and meerkats. In addition to the petting zoo, children will also enjoy a carousel and the 66,000-square-foot jungle gym playground featuring swings, slides, climbing nets and a 35-foot-tall tree house. While the centerpiece of Centennial Park is the full-scale replica of the ancient Greek Parthenon, the urban green space is also the setting for a duck pond and a large lawn for enjoying picnics and playing games. The park’s band shell hosts a variety of children-friendly performances, including puppet shows and outdoor movies. Several festivals held at the park, like the annual Arts and Craft Show, have hands-on demonstrations that kids will love. Created in 1996 and situated near the Tennessee Capitol, the 19-acre Bicentennial Capitol Mall State Park is an opportunity to explore the state’s history. During the summer months, kids of all ages play in the spray fountains that represent the Volunteer State’s major rivers and other bodies of water. Children can take a step back in time to the antebellum period and imagine themselves as Huckleberry Finn, Tom Sawyer or Becky Thatcher while aboard a paddle-wheel Showboat River Cruise. The boat travels the river past natural and historic man-made sites before docking near the Opryland entertainment complex. Situated on the eastern shore of the river across the John Seigenthaler Pedestrian Bridge, Cumberland Park is an innovative play area for children of all ages. Including water features and unique play structures, the 6.5-acre park also houses an amphitheater that hosts children’s shows. In addition to playground equipment, the park includes a climbing wall, nature trails and a butterfly garden. Situated in nearby Hermitage, Nashville Shores Water Park has a lazy river, a wave pool and a sandy beach as well as eight exhilarating water slides. You can relax on the beach and soak up the sun or enjoy a banana boat ride on the lake. Adjacent to the water park, Treetop Adventure Park boasts zip lines, aerial rope bridges, Tarzan swings and climbing nets that provide an exciting bird’s-eye-view of the surrounding countryside. Baseball, hot dogs and boxes of Cracker Jack await guests at First Tennessee Park during home games for the Nashville Sounds, the city’s Minor League Baseball team and the Triple-A affiliate of the Oakland Athletics. Head downtown and watch the future big league stars of tomorrow hone their skills as they launch their professional baseball careers. There’s even a unique guitar-shaped scoreboard! Even if you hit a patch of rain or the summer temperatures are too hot for the little ones, you can always take the fun indoors. Many of Nashville’s attractions have interactive exhibits designed to entertain children of all ages. Adventure Science Center has encouraged curiosity and inspired a lifelong interest in science since 1945. The multilevel children’s museum boasts 175 hands-on, interactive exhibits that will educate as well as entertain. In addition to exploring and gaining a better understanding of the world around them, children can soar to the outer reaches of the galaxy during a star show in the planetarium. The Country Music Hall of Fame and Museum is a kid-friendly attraction that introduces visitors to the music that made Nashville famous. Moving to its current location in 2001, the organization has interactive displays, video stations and listening booths that enable visitors to have a hands-on experience. The museum sponsors puppet shows and a variety of other youth programs throughout the year. Opening in 2001, the Frist Center for the Visual Arts has several programs that enable children to touch, feel and create art. Located in the historic Old Post Office building, the museum features the Martin ArtQuest Gallery. The gallery has 30 fascinating hands-on exhibits that inspire young visitors and offer opportunities for children to experience art by creating their own masterpieces. Visitors can discover the essentials of art, such as color, pattern and texture while creating paintings, sketches and collages. The oldest professional children’s theater in the country, the Nashville Children’s Theatre was established in 1931. The organization offers a wide range of productions throughout the year for a variety of age groups. Subjects include “Junie B. Jones,” “Treasure Island” and “Cinderella.” It is ranked as one of the top five institutions of its kind in the nation. The Theatre supports a variety of projects that help cultivate children’s interest in the performing arts. When it’s time to take a break from sightseeing and grab a bite to eat, consider one of Music City’s many themed restaurants. In addition to well-known favorites like Hard Rock Cafe and Rain Forest Cafe, you can also enjoy Aquarium Restaurant with its unique bottom-of-the-sea decor. In this aquatic-themed restaurant, you are surrounded by a 200,000-gallon water tank that is home to more than 100 species of tropical fish from the Caribbean and South Pacific as well as sharks and stingrays. Children can also take a naturalist-led tour or go behind-the-scenes and experience the excitement of being a marine biologist for the day. When it’s time for dessert, or even a tasty midday treat, head over to the Goo Goo Shop and indulge in their signature namesake confections. Nashville hosts a number of festivals throughout the year. Children will enjoy the food and music as well as the games and other activities that are available during these celebrations. Popular events include the Independence Day concerts and fireworks, the Hot Chicken Festival and the Tennessee State Fair with its thrill rides, midway-style games and interesting exhibits. Children can also dress up in their favorite costume while enjoying Halloween events at the Cheekwood Botanical Garden or feast on the excitement of the holiday season by attending the Christmas parade. 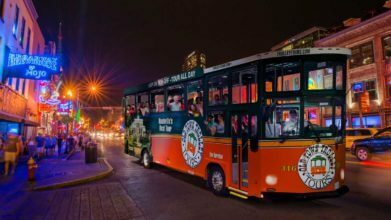 With the help of Old Town Trolley and a visit to these attractions, you can make your Nashville vacation a fun-filled adventure for the entire family!